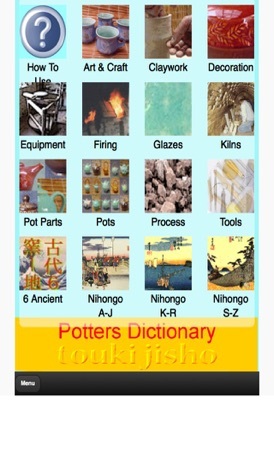 Free English to Japanese Dictionary for Potters and students of Pottery and Ceramics - Touki Jishou. 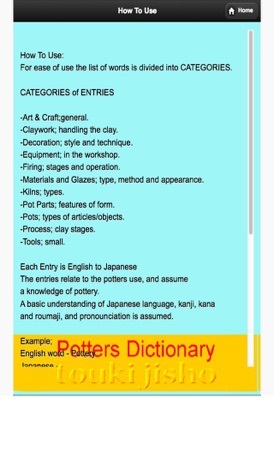 A list of vocabulary set out in categories for Ceramic Art and Craft, listing words for Working with Clay, Decoration, Equipment, Firings, Materials and Glazes, Kilns, Pots, Process, and Small Tools. 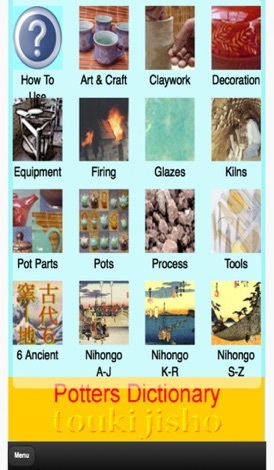 Many of the words you might come across in Japanese pottery studios and workshops. Share it as a free, amateur guide, not an authoritative source. CoccoLab "Sounds From the World" is a creative and didactic application where kids can play with parents, discovering and recognising the sounds around them. Parents can manage the play time through the "parental control" which advice them when the play time is finished. Sweet like sugar! MY CANDY SLOTS PARTY is the ultimate and super sweet Candy Slotmachine for your iOs device. It's such a fun and simple way to play slots on your iPhone, iPad or even iPod. Just place your bet, spin the wheel and have fun winning coins. Burpee Challenge - Get Stronger and Leaner with this simple CrossFit Exercise!